The controversial law enforcement practice of kettling – confining and cordoning persons, usually during a protest or assembly, often for extended periods of time – has been upheld by the European Court of Human Rights in the opinion it issued Thursday in Austin & Others v. United Kingdom. 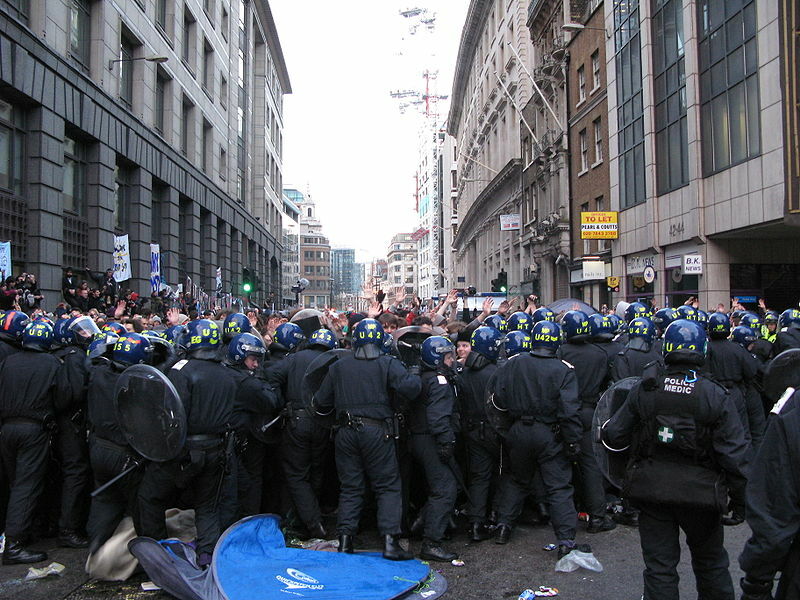 Kettling has become increasingly popular as United States police practice, including in Occupy protests. There is a lawsuit against the New York Police Department for the kettling and mass arrest at the Brooklyn Bridge last October. The ECHR case arose from a 2001 protest in London, in which the applicants were held within a police cordon for up to seven hours during the course of the demonstration, although some had no affiliation with the protest. Two of the four applicants were women. ► The first-named applicant, Lois Austin (below left), is a member of the Socialist Party and taken part in many demonstrations, including previous May Day demonstrations. (credit for 2005 photo) On 1 May 2001 she left her 11 month-old daughter at a crèche, planning to collect her at 4:30 p.m., and travelled from Essex to Central London with her partner. They attended a protest against globalisation outside the World Bank before walking with other protesters to Oxford Circus, arriving at about 2 p.m. Around 3:45 p.m., Austin needed to leave the demonstration to collect her daughter from the crèche. She explained her situation to two police officers maintaining the cordon, but was told that she could not leave and that it was not known how long it would be before she would be able to leave the area. Austin arranged for a friend to collect the child from the crèche. She was finally allowed to leave at about 9:30 p.m.
► The third applicant, meanwhile, had no connection with the demonstration. She worked in the Oxford Circus area and was on her lunch break at 2:10 p.m. when she was prevented from returning to her workplace by a line of police officers blocking the road. She turned and tried to pass in another direction, but found that that exit was also now blocked by police officers, who began to advance towards her. She was held within the cordon at Oxford Circus until 9:35 p.m. She and others repeatedly requested to be allowed to leave the cordoned area but were told by police that they were under orders to allow no one to pass. 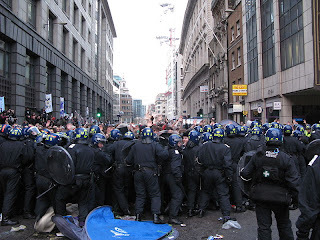 In the UK proceedings, the judges rejected the applicants' claims of false imprisonment and denial of the right to liberty (interestingly, the applicants had dropped their original free speech and free assembly claims), reasoning in large part that law enforcement had to perform their duties of crowd control. The UK government argued that there was no denial of liberty, but if there was, it was within the Article 5 exceptions of (b) or (c). Three judges – ECHR Vice-President Françoise Tulkens (right) of Belgium, along with Section Presidents Dean Spielmann of Luxembourg and and Lech Garlicki of Poland – dissented. They contending that "the aim or intention of a measure cannot be taken into account in assessing whether there has been a deprivation of liberty," but are only relevant in assessing whether the deprivation of liberty was justified. Indeed, this does seem as if it is the better view, although the outcome might be the same. A deprivation of liberty for seven hours does not become less a deprivation because of the rationales for the police practices, although those practices might be justifiable. 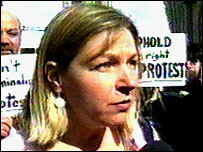 Journalist Louise Christian of London's Guardian has commentary here.